Do you have a ghost story about Idaho to tell? 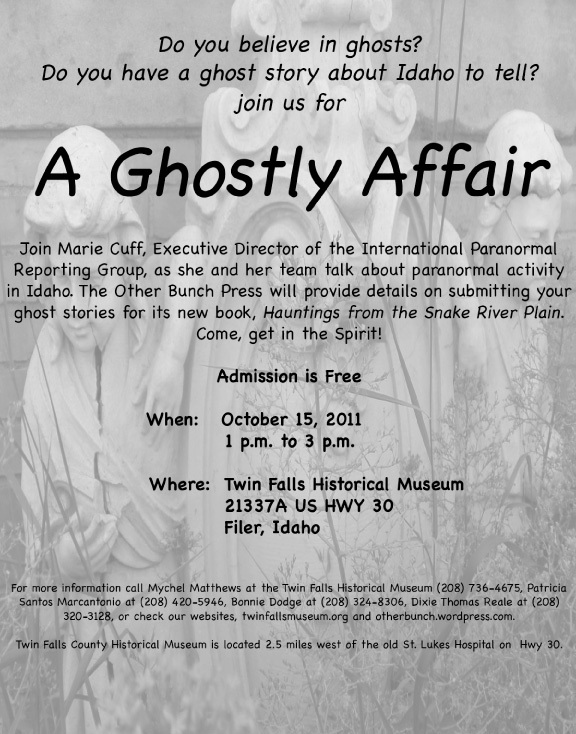 Join us for A Ghostly Affair, as Marie Cuff, Executive Director of the International Paranormal Reporting Group, and her team talk about paranormal activity in Idaho. The Other Bunch will provide details on submitting your ghost stories for its new book, Hauntings from the Snake River Plain. Marie and her team will be investigating historical Stricker Ranch the night before. Come find out what she found lurking in the dry cellar, if anything. This will be a fun event, and admission is free! Join us for a great, enlightening day and learn a little about the history of southern Idaho. See you there! This entry was posted in Events, History and tagged ghosts. Bookmark the permalink.